In an effort to assist struggling coin magicians with their Spellbound routines, the British Royal Mint will ditch its venerable round 1-pound coin in favor of a new 12-sided model specially designed to be a sharp contrast to any other coin used in a Spellbound routine. Oh...and something about them being harder to counterfeit, too. David Neighbors is a name known to all serious coin magicians. His creativity and passion about coin magic are boundless. And that's not just hyperbole! He has been known to session for 8 hours just on coin magic. And his capacity for visualizing new coin gaffs has kept one of the top coin makers in the world on his toes. Conjuration Publications has just released the first of FIVE hardback books containing every David Neighbors creation and a ton of never-released material! My copy will be on it's way soon. And once I've devoured the first volume I'll post a review. I know this is going to be awesome! The world of coin magic is curiously bereft of Coin Flourishes. Where card magic is over-flowing with them, coin magicians seem to restrict themselves to just the Steeplechase. I think a few well-executed flourishes greatly enhance any coin effect. So here is a quick contribution from my ShowOff With Coins DVD; the 3 Coin Roll Down. It's an easy version of the classic 4 coin roll down. I like to use this flourish at the end of a 3 Fly effect. When the final coin vanishes from the left hand, I close my right hand around all it's coins, as if catching the in-transit 3rd coin. A slight pause and then I roll the coins out into the 3 formation. This helps to build some suspense before the reveal of the 3rd coin. It shows off a bit of skill. And it ends the routine with a nice display. The mechanics should be pretty easy to pick up from the video. If not, here's a quick tutorial. The coins come in 10 different colors. I'll use the gold coins for effects like 3 Fly, Gadabout Coins, and one-coin Flurries. Then I'll use the green coins for Spellbound changes. The colored foil is in 2 halves so it's easy to make a double-sided coin by carefully prying off the foil cover from one side of a coin and adding it to another coin. I'm using mine for Marion Boykin's Copper/Silver-Surprise! 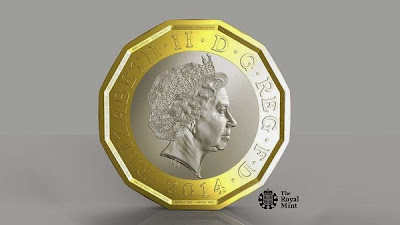 I'll produce a silver coin and turn it to green and back to silver several times then turn it to a gold coin. And of course, the gold coin is a great giveaway. 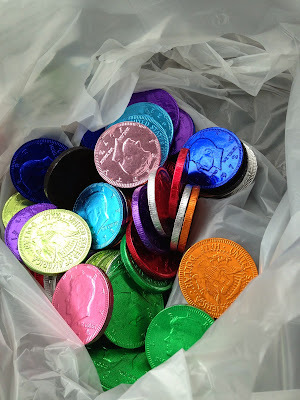 The chocolate coins are 10 cents each and are about the same diameter as an American half dollar, but thicker and much lighter. So some practice is definitely needed before you run out and perform with them. But you'll get the feel for them pretty quickly. Magic and chocolate, what's not to love!? Some coin magicians seem to think they are more skilled than the average card magician because there is no deck to hide behind. From Day One a coin magician is doing sleights. There are no self-working coin tricks. Actually…a quick fly-by of a popular magician’s forum showed references to 19 different gimmicked sets of coin sets! I’m not talking about shells or Scotch & Sodas, or even Flippers, but sets like Triple Threat, Super Triple Coin, TUC, Cerberus, Ultimate 3-Fly, Coin Bomber, Come Fly With Me, N3, Triception, Night Shade, and Mirage Coin Sets. It’s true that you can’t buy coin gimmicks at the Dollar Store and our gimmicks tend to cost about 2000% more than the average trick deck. But who are we fooling? I had the pleasure of working for several years as a magician for Caesar’s Resorts and Casinos. I met and worked with some great magicians. But there was one particular guy whose table-side performances really struck me. He’d approach the table with a brightly-colored fanny pack filled with trick decks. He’d place the fanny pack on the table, take out a deck and do a trick. Then he’d replace it, make a big deal of thoughtfully choosing the next deck to use, take it out and do a different trick. Rinse and repeat for the next 10-12 minutes. A different gimmicked deck for every trick he did. He got polite applause. But the applause wasn’t for him, it was for all the clever trick decks. And regretfully, yes, I’ve seen this done by coin guys, too. The coins were in an attractive little leather purse with multiple pockets. But the crime was the same. Hopefully most coin magicians with a pocket full of gimmicked sets would have the sense to do a pocket switch and never let on that they have anything more than a couple coins on them. Are we turning into the Fanny Pack guy? How many $200 gaff sets that do Three Fly do you need? Don't forget that Jonathon Townsend and Chris Kenner started that phenomenon with just a couple regular coins at their fingertips. I think the key is to use as many gimmicks as you can reliably, and INVISIBLY, bring in and out of play. So long as the audience is only aware of a couple coins, then all the applause and adoration go, as they should, to you. Friends don’t let friends become the Fanny Pack Guy. Instant Gratification: Radek Makar's "Into Thin Air"
You've got $5 burning a hole in your pocket. What to do? Grab a Vanilla Carmel Macchiato from Starbucks or learn a super-clean vanish and reproduction of 3 coins? Of course, the coin trick! Duh. This routine is a real worker. There are no gimmicks and only 3 coins are used. The coins can be borrowed and can be replaced with casino chips, tokens, or even Girl Scout Cookie Thin Mints...mmmmm, Thin Mints. There are no clothing or lighting restrictions and the routine looks as good in person as it does on YouTube. All this for just $5! Grab Radek's Into Thin Air instant download at VinnyMarini.com or at Chris Wasshuber's Lybrary.com and you'll have a stunning anytime/anywhere miracle by tonight. Then you can use it to impress that cutie at Starbucks as she brews you up their latest diabetic nightmare. Throw out your Purse Frames! I am always trying to replace out-dated props with something modern. Unfortunately one of my favorite props is the tired old purse frame. I do several effects that utilize the frame in different ways, so I didn’t want to stop using it. But I am finding that fewer and fewer people recognize what this weird little item is. During my table-hopping gig this last week, I had several people who had no idea what the purse frame was. I had to take extra time to explain it, which slowed down the routine. This weekend, thanks to my daughter’s love of vending machines, I found the perfect replacement for this magic fossil. Enter the Hip Zip Bracelet! 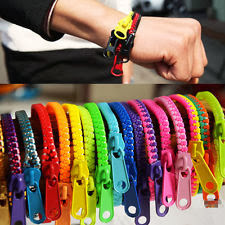 A Hip Zip Bracelet is a brightly-colored, plastic bracelet that is also a zipper. The look is hip, modern, colorful, and fun. The bracelet has some stiffness to it so you can hold it in the correct position for most of your favorite purse frame moves. There is nothing to carry around because the Hip Zip Bracelet rides along on your wrist. When you’re done, just hook it back onto your wrist and sally forth to the next group. And it’s a great conversation-starter, which helps lead you into the magic. The Hip Zip has a fun look that works for men or women, young or old. I spent the evening working with the Hip Zip. I tried out a couple of my favorite routines that use a purse frame, including Curtis Kam’s Coercive Purse. I found that only a bit of re-blocking is needed to use the Hip Zip. Some routines required a bit more adapting, like Shoot Ogawa’s seminal Neo Purse Frame, but the results are definitely worth it. I strapped on a black Hip Zip and headed out to my regular restaurant gig. The reactions were great. I even had a couple people comment on the bracelet before I did, which made for the perfect lead-in. I got my Hip Zips by dumping $5 worth of quarters into a Wal-Mart vending machine. But, I have since found some good deals online. Here is a link, and another, and a Google search so you can check them out for yourself. And if you make to one of my lectures, I’ll be sure to have some on hand. If you're having trouble finding these in your area, or if you want a little more creative control over the look of your zipper bracelet, here is an excellent (and very easy) tutorial on how to make your own Zipper Bracelet. Cardini (Richard Valentine Pitchford) was a British stage magician whose career spanned from the 1920s to his death in 1973. Cardini was also a 3-time President of the Society of American Magicians. Although he is best known for his stunning card manipulation performed while wearing gloves, he was also quite adept at coin manipulation. This 50+ year old video gives us a glimpse at the mastery Cardini had over coins. I especially like his production of four coins from Edge Palm/Classic Palm around the :40 mark. This rare footage was shot on a cruise by a Dr. Morris Young and has been lovingly restored by Steven Max Droge.